crop_rec, Movie crop mode, zoom mode, 3x3, 3x1.6, yeah this is confusing. What's worse is that this discussion is about getting mv1080 working on the EOSM so pretty much nothing in your post is on topic. I give up!, Also this mode still gives you 3x zoom ? that is my whole point in wanting it. Movie crop mode is the only mode giving 3x zoom. crop_rec is a smart way of binning mv720p footage so it gives same quality as mv1080p. Caveat. You get lesser height. 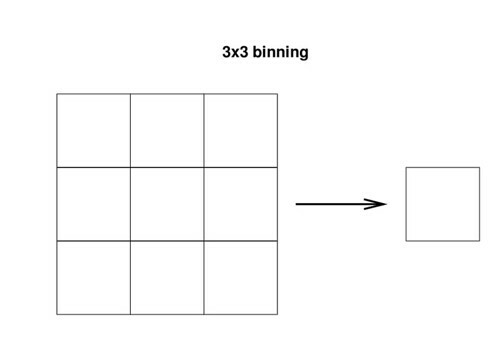 The confusion seems to be between 3x3 and 3x. 3x3 can mean that the sensor is combining 3 pixels in the horizontal and vertical axis. This is know as binning. Only the 5D mark III does this. All the other cameras, including the EOSM does what is called line skipping. It is a little more complicated because of the bayer pattern on the sensor this but let's simplify it to illustrate what is going on. Binning is making these nine pixels behave like one giant pixel while line skipping only uses the one pixel in the middle. Line skipping is much simpler but it does have aliasing issues. The net result from both of these methods is the same. Start with a sensor that has an active horizontal resolution of 5,760 pixels and a vertical resolution of 3,240 and you end up with a 1920x1080 image after doing 3x3 pixel binning or line skipping. Now the EOSM and most of the other Magic Lantern enabled cameras don't have that high of a resolution. The EOSM has a 5184 x 3456 (18 megapixels) sensor so the maximum resolution, assuming you want to keep the HD aspect ratio of 16:9 is 1728x972. How does it do 1920x1080 H.264 video? We're pretty sure it scales the image. How about 1280x720? It does a 3x5 pattern which means it skips (or in the 5D3 bins) 5 pixels vertically and again resizes in camera for H.264 but in raw you need to adjust the aspect ratio to un-squish it. 3x crop on the other hand uses all of the pixels, a.k.a. a 1x1 pattern. Since the pixels are closer together and there is no line skipping there is also less aliasing but a 1920x1080 image would use just a small area of the total sensor thus the "crop" in this video mode. You don't need a module to do this, it is either the "Movie crop mode" option or the digital zoom option. One thing I personally like about Movie crop mode when shooting H.264 is that it extends the effective focal length of your lens so that a 16mm prime lens can become a 48mm lens or adjusted to full frame if your brain thinks that way it would be like having about a 26mm and a 77mm lens in one. Sort of, not really, but good enough to make a point. Uh oh, I mentioned zoom mode. This isn't as well known but if you tap the magnifying glass icon on the screen while in 1920x1080 mode in the Canon menu you can also get into a crop mode, confusing because it says 5x or 10x on the screen and you will get the same image no matter which setting you use. The big secret is that you can get an image up to 2496x1072 but it isn't all that practical to use. The crop_rec module on the EOSM doesn't actually "crop" and it uses the 3x3 pattern. Thing is, it uses the raw buffer that is supposed to be used for mv720 mode which is normally a 3x5 pattern so as Danne pointed out it quickly runs out of vertical resolution, thus most shots you'll see from the crop_rec module on the EOSM are very wide screen aspect ratios. Finally, to get back on topic, the EOSM can't use the full sensor in 3x3 mode which is known as mv1080 in the ML source code. We're trying but so far the only hack seems to be to record H.264 and raw simultaneously. You'll get lots of corrupt frames and a few beautiful ones that inspires us to keep trying to get this mode working on the EOSM. So does this make everything about as clear as mud? these new builds have h.264 proxy so any developments on mv1080 with that? we need h.264 running to kick the eos m into mv1080 as i understand it.. Yes, it goes into mv1080p mode while proxy is on. The proxy files are choppy and the mlv files are partly corrupted and a few ones looking good. Works better with 10bit. While filming proxy and raw and lowering fps to something around 10fps it actually records mostly corruptfree files and in correct order. There is a way to film corrupt free mv1080p footage. It ain,t beautiful but it works. Finally managed to downgrade back to 202 from 203 with ease (not quite actually hadn't realized I was in CA mode and not in M mode until just recently and only god knows how long I was in that mode for ha!) as usually with the EOSM I can easily forget that the Modes are only accessible through the 'Q' menu as oppose to most DSLR's would have access to these outside within the body. Anyway was this done with the latest experimental (ml-raw_video_10bit_12bit.2017Feb11.EOSM202) or the one before that @Danne? <-- Oops looks below! Only asking because I notice this build was missing the option that enables H264 Proxy (as it did in previous build afaik) so could this have anything to do with commit #88b2139 (Merged raw-h264-proxy into raw_video_10bit_12bit)? My wrong ... I realized that the H264 Proxy is only available under 'Advanced...' within the RAW module menu (mlv-lite.mo) and not MLV module. D'oh! After all I will get my hands dirty with this momentarily and report my findings asap. Shot in 24p 1792x1008p in 10-bit RAW (build used: ml-raw_video_10bit_12bit.2017Feb11 from experimental page) w an Opekta 6.5mm @ ISO 800 while in 'Movie crop mode' during early afternoon from indoors. Post workflow: MLV > cr2hdr.app (spat out ProRes 422 Proxy files w Rec709 applied) while I got 4 seconds in each take and it's 99% close to perfection. Seriously no joke in here! Are you getting 1792x1008? What build are you using? OKi you,re in movie crop mode, didn,t realize. mv1080 ≠ "movie crop mode"
mv1080 on eos m filmed with dannes settings with c mount 12.5mm lens. shows that the framing is not centered. also getting purple footage on some clips like the first then regular footage like the second clip. does work though. I haven't yet tried his suggested settings, but what I don't understand is that you have said to use the 1488x692 resolution, but how could that be MV1080? Wouldn't MV1080 be 1792x1008? I love all the work that's going into RAW, it's really amazing!